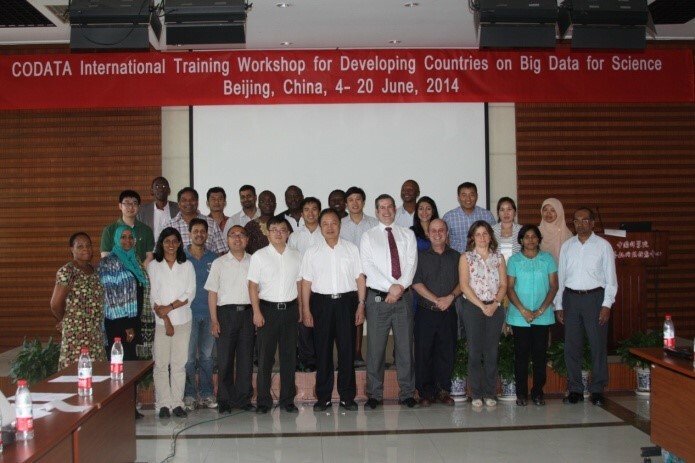 The International Training Workshop for Developing Countries on Big Data for Science was held at Computer Network Information Center (CNIC), in Beijing, China, from 4-20 June, 2014. There were 21 researchers, data managers, and data scientists from 10 developing countries including Vietnam, India, Mongolia, Indonesia, South Africa, Kenyan, Tanzania, Columbia, Brazil and Uganda attended this training workshop. The International Training Workshop was co-sponsored by CODATA and Chinese Academy of Sciences (CAS), co-organized by CODATA Secretariat, CNIC, Chinese National Committee for CODATA (CODATA-China). The training program offered aims to engage participants with a number of facets of data science and data management in the Big Data age. Topics include, but are not limited to, interdisciplinary applications of data intensive research, data management policies, cloud computing, visualization and data infrastructure development in the Big Data Age. It focused on data science and data management in the Big Data Era. Through a mix of theoretical study, attending Workshop on Big Data for International Scientific Programmes: Challenges and Opportunities and practical sessions as well as field visits, it helped participants catch the latest Big Data technologies and information. The International Training Workshop for Developing Countries on Big Data for Science was held at Computer Network Information Center (CNIC) from 4th July to 15th July, 2016. There were 21 researchers, data managers, and data scientists from 12 developing countries including Vietnam, India, Botswana, Indonesia, South Africa, Kenya, Tanzania, Ukraine, Poland, Philippine, Nepal and Madagascar attended the training workshop. 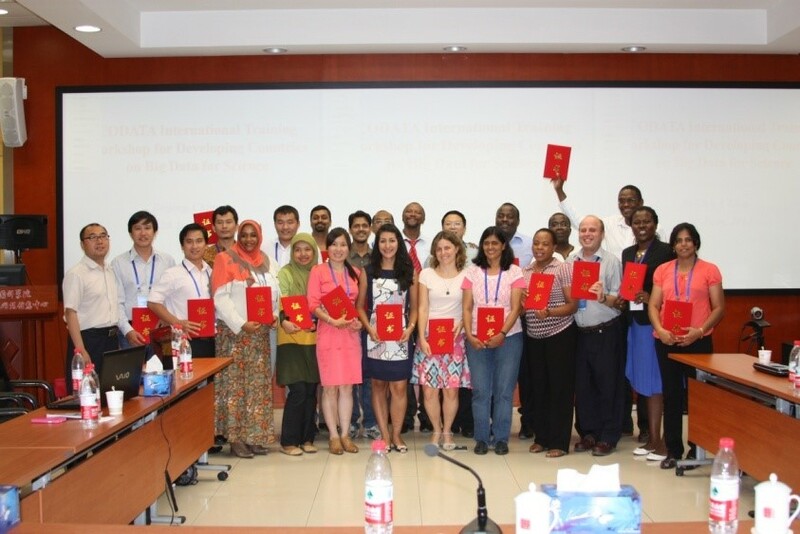 The International Training Workshop was co-sponsored by Committee on Data for Science and Technology (CODATA) and Chinese Academy of Sciences (CAS), co-organized by CODATA Secretariat, CNIC, Chinese National Committee for CODATA (CODATA-China). The training program offered aims to engage participants with a number of facets of data science and data management in the Big Data age. Topics include, but are not limited to, interdisciplinary applications of open research data, data intensive research, data management policies, cloud computing, visualization, analytics and data infrastructure development in the Big Data Age. Through a mix of theoretical study, workshop and practical sessions as well as field visits, the organizers aim to help participants develop a deeper expertise in the latest Big Data technologies for scientific discovery. There are four phases of this Training Workshop. On Opening Plenary Session of Training Workshop, Dr. Simon Hodson, Executive Director of CODATA International, gave a lecture on Global Collaboration in Data Science: an introduction to CODATA. This presentation provides an introduction and overview to CODATA’s current activities and strategy. Then all the participants gave a short presentation on their research and introduce the data challenges and development of science and technology of their countries. In this part, the lectures focused on data management planning and data visualization, gave an introduction of research data service and visual analytics. All the participants attended ISDE Digital Earth Summit on 7-8 July and visited National Space Science Center (NSSC) and Huairou Branch of CNIC. In this part, professors introduced the case study in their field, including Open Data Policy and Best Practice, Chinese Approach to National Earth Observation Data Sharing, E-science Practice in CAS, Global Change Research Data Publishing, Repository and Sharing, Research Data Publication，Status and Development of Biodiversity Data in China. 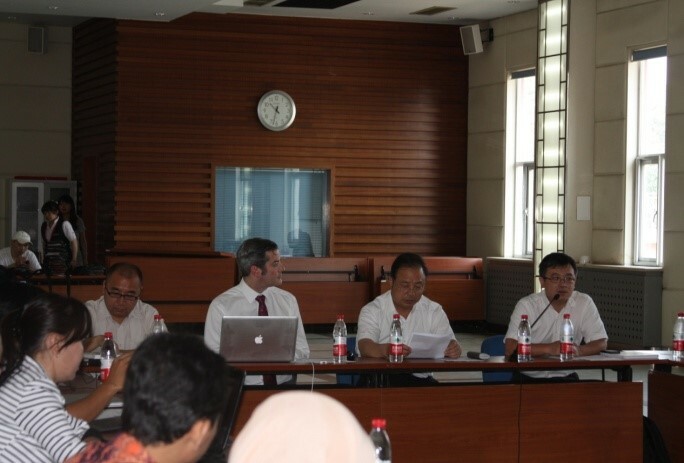 All the participants gave presentations and shared their experience and interest from this Training Workshop. Prof. Jianhui Li gave a closing remark and awarded certification to all the participants. See also: CODATA International Training Workshop in Big Data for Science, for Researchers from Emerging and Developing Countries, Call for Applications, March 2014.